“The ‘BRICs’ acronym, in its most common usage, derives from a report to investors by Goldman Sachs’ analyst Jim O’Neill, signalling the new dynamic that four large countries; Brazil, Russia, India and China, were bringing to the global economy at the beginning of the new millennium. The “at the beginning of the new millennium” part must be why the globalists launched the G20 on the eve of the new millennium (the inaugural meeting was in December 1999). They brought the BRICS into the global governance system even before the actual alliance began to form in 2006 — even before the term “BRIC” was coined in 2001. 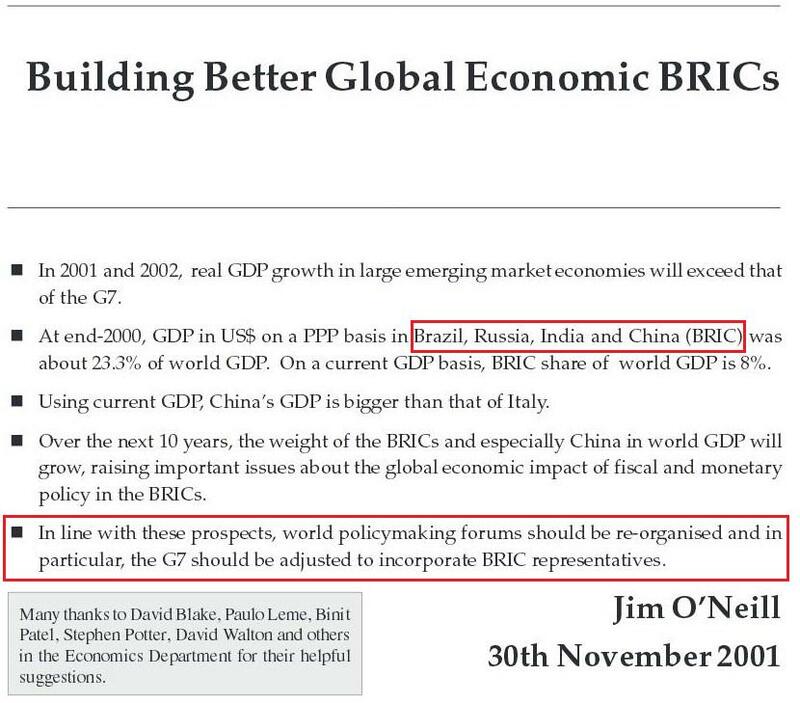 So Goldman Sachs’ Head of Global Economics Research originated the BRIC idea, and five years later, the four nations began to meet with each other. See George Soros and the elite’s China-fronted New World Order for more details on how the BRICS got started and how the G7 was superseded by the G20 in accordance with the recommendation offered in the Goldman Sachs paper. And who are the ones behind “the global governance system created following the Second World War”? For the answer, have a look at China’s complicity in building the Rockefeller New World Order, in their own words, which gives a quick overview of the UN Complex and the Rockefellers’ role in helping create it. And to see why “US leadership and hegemony” has been a “vital element” in broadening the global governance system, have a look at The Rockefeller Plan for the BRICS New World Order, in their own words, which shows how the globalists planned to lead the US into national suicide in order to give rise to the New World Order. This entry was posted in NWO on January 22, 2015 by kenneth.